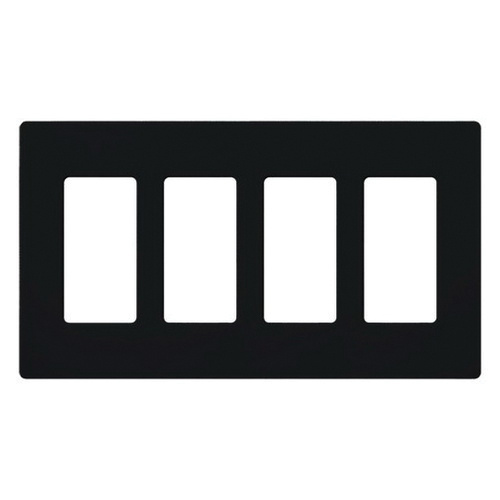 Lutron Claro® 4-Gang Oversized wallplate in black color, features tough thermoset construction with gloss finish. Rectangle screwless wallplate measures 8.37-Inch x 4.69-Inch x 0.30-Inch. Flush mountable wallplate has four rectangular device configuration. It is suitable for Maestro®, Maestro Ir®, Maestro Wireless®, Pico™ wireless control, Spacer System®, Diva®, Lyneo® Lx, Skylark® and Skylark Contour™. Wallplate is UL listed.